Bitcoin (BTC) started to rally as it bounced off the bottom of the ascending channel it has been trading in since the beginning of the month. BTC/USD was expected to rally towards the top of the channel but this rally has now come to a stop as the bulls have lost control. The 4H chart for BTC/USD shows that the RSI is now due for a sharp pull back in the near future that could pull Bitcoin (BTC) back to its trend line support. The more Bitcoin (BTC) tests this trend line, the higher the probability that it is going to break below it. In case that happens, the price will find support on the 200 EMA to consolidate before its next decisive move. 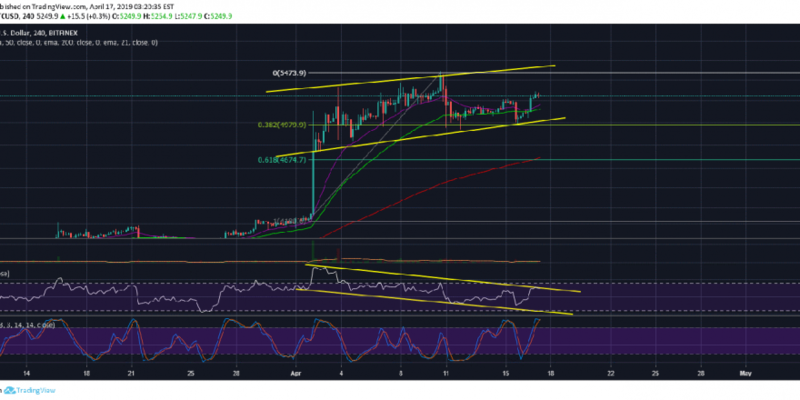 The price of Bitcoin (BTC) is still overbought on the weekly time frame and more analysts are beginning to realize that the price may not have bottomed yet. The bullish euphoria seen the past few days when the crypto community was calling for the beginning of a new cycle is lost all of a sudden. The Fear and Greed Index that declined to 50 yesterday is now back above 60 as the recent rally instilled some hope in the market. However, now that this rally has come to a halt, we could see a sharp decline in BTC/USD towards the end of the week. Bitcoin (BTC) has long stalled a move to the downside but it cannot do that for long and will eventually have to decline most likely when the S&P 500 begins to nosedive. A stock market meltdown would be devastating for Bitcoin (BTC) and all other cryptocurrencies (excluding stable coins). The weekly chart for BTCUSDShorts shows that the number of margined shorts is now expected to rise after months of decline. This will lead to renewed pressure on Bitcoin (BTC) that will once again make the bears in control and allow for a steady decline to $1,800 or lower. Most traders and analysts that considered the price to have bottomed out in December, 2018 are now having second thoughts because BTC/USD is showing no signs of going up from here. The price action is married by instability and weakness and as the number of margined shorts begins to pile up again, we would see the bulls panic sell. As much as we’d all like to believe that the recent rally in Bitcoin (BTC) was fueled by real interest, the fact of the matter is that it is not. This is just short term speculators trying to make a quick buck and once they realize that the rally has lost momentum, they will quickly switch sides and side with the bears take the price to lower levels. The fall below $6,000 was significant because it was a strong support zone. However, now it will be a strong resistance zone and if BTC/USD faces a rejection in that zone which is very likely, the probability of it declining to $1,800 or lower levels will increase significantly.